Pre-heat oven at 350 degrees F.
Mix coconut flour and baking powder, and then set aside. well. Spoon batter into 8 muffin tins lined with paper liners. *If using salted butter salt is not needed. I love this recipe. I substituted with almond milk and made a powdered sugar topping(with almond milk and lemon) to drizzle on top. Also, I cored out a little hole in the middle after cooking and filled with fresh raspberry puree. can i substitute 2-3 eggs with flaxseed ? (the mix flaxseed meal with water to become gel)??? Thanks for giving us the recipe for the Lemon Blueberry Coconut Muffins, Beth, they sound yummy! I think I’ll try them, but I’ll use sugar instead of the sugar substitutes. Thanks again! Since I can’t have eggs, and have to be gluten free, I’m wondering if there’s a liquid substitution that works for all those eggs. Really good! I added fresh blueberries. Can I substitute honey for the sugar? If so, how much? Yes and yes. I recommend coconut milk for the milk and coconut oil for the butter. those look soooooo good! 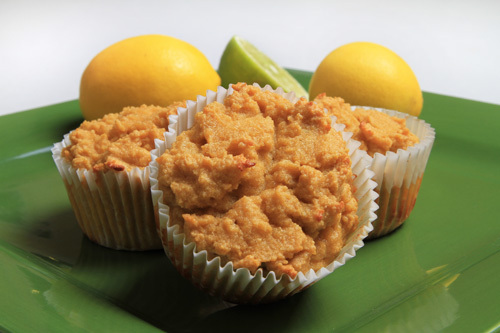 I love lime and lemon… and the banana coconut muffins I made were sooo good. didn’t even have a coconut flavour, but a nice banana flavour and a very nice texture. I’ll be making them again sometime.